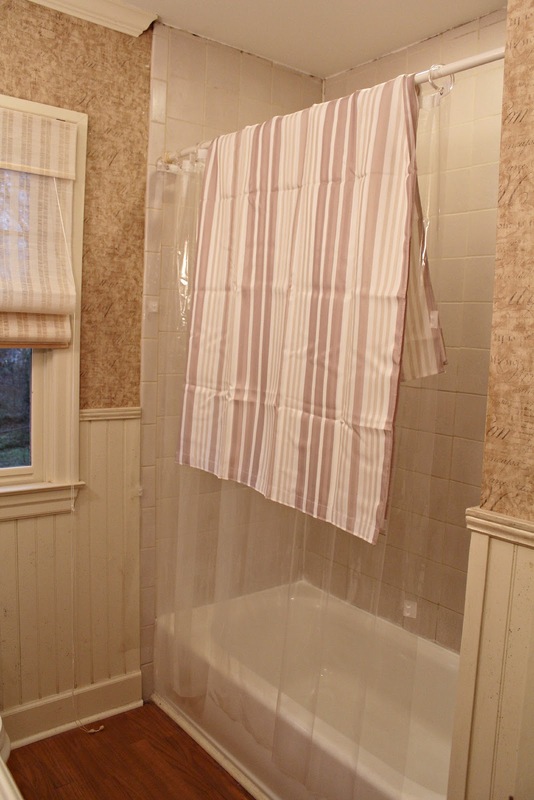 Ten June: Guest Bathroom: Help Me Pick A Shower Curtain! Next up? It's time to accessorize. Starting with a new shower curtain! I'm a girl who likes options, so I went to a couple of my favorite home stores (Target, Bed Bath & Beyond and HomeGoods) and picked up some potential candidates for the new shower curtain. This is David's favorite pick for the room. The lighting in this picture is a little off (it was raining for like 36 hours straight, so I couldn't get a sunny shot!) but the colors of the curtain complement the neutral colors in the room. Quite well, actually. If we went this route, I'd add a few pops of color in with accessories (like maybe a green potted plant?). Here's option #1 with the whole room. Another great neutral alternative. 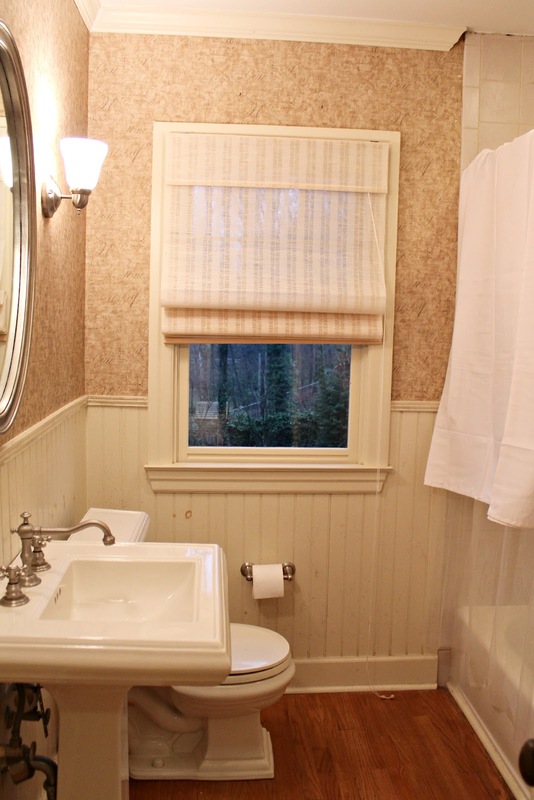 The bright white balances out the cast iron tub and white porcelain sink and toilet. Plus, it's such a classic, you can't go wrong. And a full room view. This fun guy is the same pattern we have for the hand towels in our guest bathroom (from Tarjay). The curtain has a lot going for it- neutral colors + bright white + splash of color + some fun, modern patterns. Me likey. Here she is with the whole room. And just in case you forgot what we've been working with in this space, here's Paula the Plaid Monster. So friends, what do you think? Give me a vote! 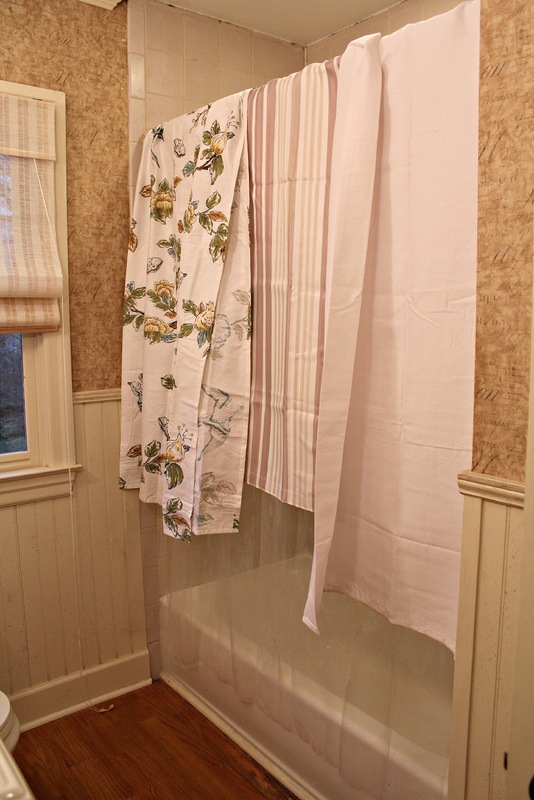 Do you like shower curtain #1, #2 or #3?! Psst! No, my shower is not dirty there at the top where the ceiling meets the tile... some of the dark purple paint from the previous ceiling got on the tile so we're working on cleaning that off and recaulking the space so it's so fresh and so clean, clean! without a doubt the white waffle... i feel like the stripe fights with the stripe in the curtain. the waffle lets the bathroom's details pop rather than the shower curtain. #3 for sure. U still want ur house jazzed up for buyers. If you were decorating for you, I'd say the floral curtain all the way. But since you are decorating for potential homebuyers, a simple waffle curtain would be best. #3!! That cute pattern with the color really pops. I love it! I'm pretty sure I always go with anything labeled "The Funky Splash of Color." Love it! First, yes I noticed the ceiling! LOL And two, no stripes-compete with window shade, waffle-safe, print-love!!! Love all the options, but I have to go with option #2. 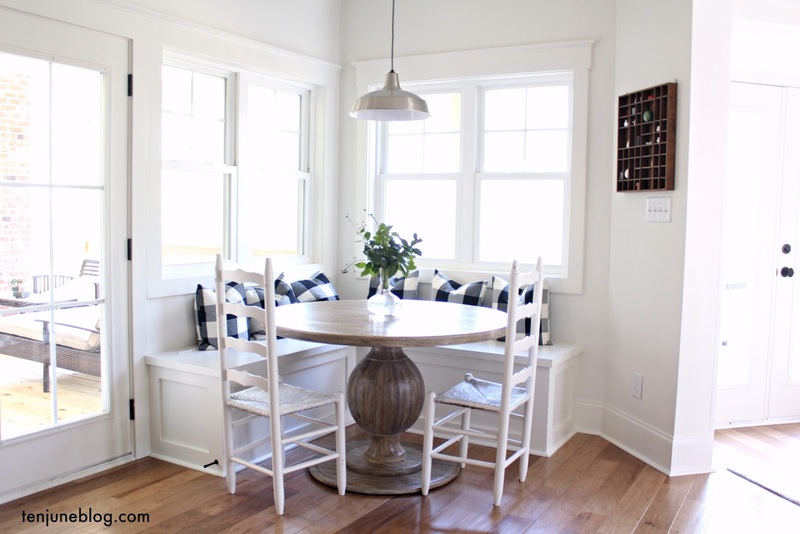 It gives off a fresh and clean look and buyers love that! I like option 3! I also think you cant go wrong with the white waffle. I would say that the patterned one is great, but the waffle weave may be best for selling. I concur with others about the stripes competing with the window shade. I vote for number 3. It looks really good with the other elements going on! Option #3: The Funky Splash of Color - for sure. To live with: #3...so much fun! But to stage/show the house: #2. Classic and not taste specific or feminine. Gotta go with #3! It just seems to go with everything else you've got going on in your house. Fun, fresh, and cheerful! I love the pattern in #3! Adds just the right color pop. I'd go white - mainly for resell purposes. Plain and simple seems to do the trick when selling a house. I like the white waffle best -- are you taking down the wallpaper? I think white shower curtains are always a classic & clean looking touch in a bathroom... but I do enjoy white linens ;) But really, great for baths, especially one you're essentially staging to sell! I like #2. Like you said, it really balances out the room. Plus, since it is simpler it will help potential homebuyers see how they would work with the space and add their own personal touches. I like #3. Think model homes, buyers really do like decorated spaces! I think #2 (the white waffle) looks the best for selling the house. I love #3 but I think it's a little too specific to your decor taste. The white makes the bathroom look fresh and neutral, easy for any potential buyer to like, no matter their style. All of them look so much better than the Plaid Monster though!!! I say the plain white one -due to the fact you are staging this room for re-sale keep it simple. If this was "your" space then I would say go for the patterned one. But keeping it neutral for potential buyers is best. This room is really coming together nicely!! #3. Really don't like #1, it's too much of the same for the room. #2 is my runner up. I love #3 because it looks so fresh and springy. What potential buyer wouldn't like that? I love # 3. Number 2 is my second favorite. my vote is #3! adds a subtle pop of color in a pattern that any buyer will like! I'm surprised everyone is saying the stripes clash with the window. I was thinking, "Oh cute! The stripes would complement the window stripes!" But I guess that's why I have a food blog and not a house blog. 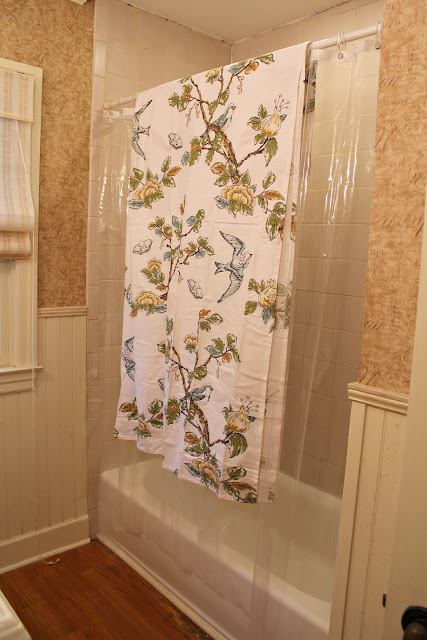 Like everyone else, the patterned birds are my favorite but since it's so stylized you may get a buyer who can't look past the shower curtain. Stripes or waffles, your pick! For selling, go with the white. Buyers want to envision with their own creativity and sometimes too much going on is a distraction. My vote is for number 3 !!! Okay, my personal favorite is #3, but I think the best for resale is the white waffle. I worry that someone might walk in and dislike the pretty bird pattern. That could affect how the whole house looks to them. Good luck! Number #2 is by far my most favorite option. 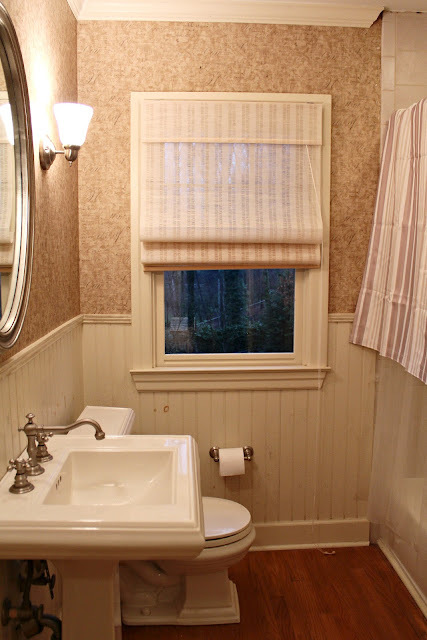 The simple, clean white waffle weave highlights the bathroom's features. It makes the woodwork and pedestal sink pop!! Number 3 all the way - it looks great. #3 - pop of color! 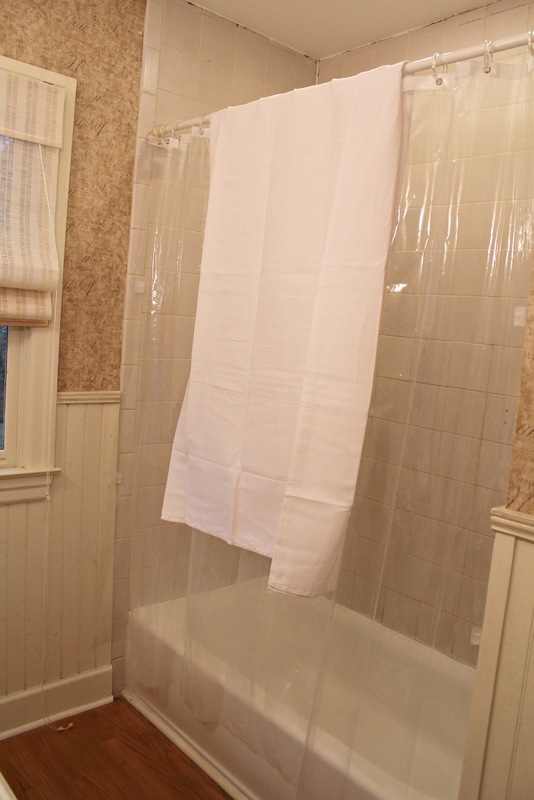 It's just a shower curtain - that won't scare buyers away. When people are house hunting, everything starts to blend together. This will help the bathroom stand out. I have that hand towel too! I vote #2. I think it is what a buyer would like best. You could save the others for your next house since you both like them. I'm personally drawn to number 3, but everyone's right- gotta stage to sell- so I'd go with white! Definitely waffle white for me. It really helps the white sink and things pop, plus the texture from the walls looks a little busy with a patterned curtain. I'm with sticking with neutral for resale. So I vote for the waffle. Love that texture anyway. But I do like the print. Very fun ! Will be anxious to see what you decide. I love #3 and would want that for my house, but for resale, I would play it safe and stick with the white. Most buyers are boring and have no imagination. white waffle. the wall paper is too busy for the fun colorful one. IMO. #3 FOR SURE!! Looks amazing!!! The classic white for sure! If you were not selling your home I would recommend something with color, but neutrals are best for potential buyers! I would go with Option #2 for sure! Option #1 competes too much with the window shade and Option #3 would be my choice if it were for you to live with but for selling purposes I think it's too busy. I like Option #3, but whatever you pick will look great! I'd go with the white but only because I feel like the patterns compete with wall paper. 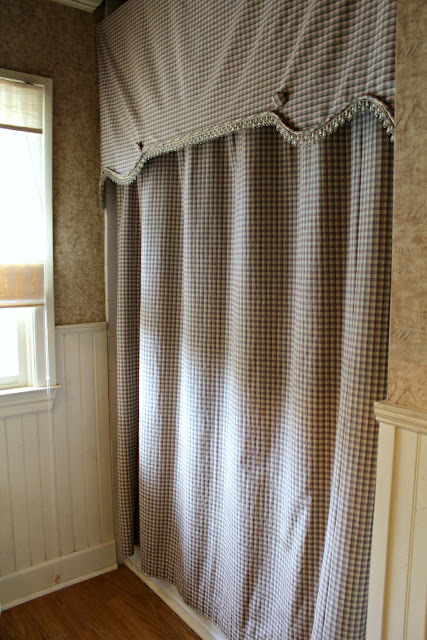 But otherwise the third curtain is my favorite and would look beatiful in an white, blue, green or gray bathroom. Numero 3!!! Love the pattern! Yes, Go with #3! #1 is competing and #2 makes the cream/off white look drab bc it's SO white!! Hmm, if you have to keep the wallpaper, then I would go with #1. Good luck choosing! Usually I don't go for prints, but I absolutely love #3 in that bathroom! I think the neutral stripe is best for selling a house. My second choice would be the classic white ruffle. If I were going to live with the room and NOT sell, I'd pick the patterned colored curtain for sure! I love how the patterened one (#3) looks, but for selling, the classic white might be the best choice. Good luck! I think that the classic white one makes your beadboard and trim paint look dingy. I'd go with number #3. #3 is definitely my fave, followed by #2, but unfortunately not a fan of #1. Definitely #3. Gotta love the pop of color and layering patterns. My top pick for selling is white waffle, my top pick for living is the floral - exactly like DEcorandtheDog said above! Ugh... I would TOTALLY choose #3 for real life, but when we sold our last house I swapped out my regular shower curtains for white waffle ones. I don't think you can go wrong with clean & fresh white! Love love love option #3...the floral! It really ties the space together and adds interest. Super cute! LOVE #3. Fun and pretty. The first one is too many stripes in the room and the color isnt right. #2 is great- but if you go with it, I would definitely tea stain it and give it more of a cream color! For sale, classic white (#2). For staying,#3. Fo sho. For selling I'd say #2 the white one. Floral...cause it looks good and youll want it for your next house! If nit for the shower, then as a tablecloth. 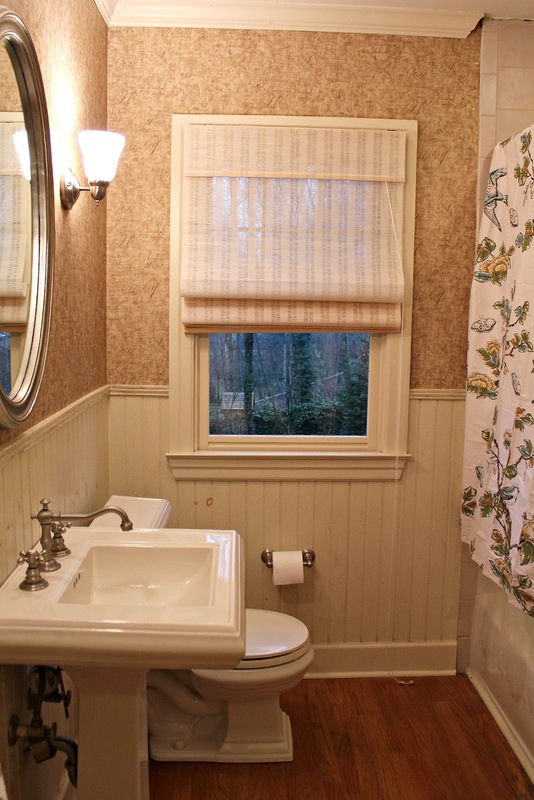 The white one makes the wainscotting look dingy. Ur prev owners loved some cream trim! !